Heparin-binding EGF-like growth factor (HB-EGF) is a member of the EGF family of proteins that in humans is encoded by the HBEGF gene. Heparin-binding EGF-like growth factor (HB-EGF, pm 22 kDa) is a 87 amino acid glycoprotein, member of the epidermal growth factor (EGF), termed HB-EGF for his affinity with heparin. It's synthesized as a membrane-anchored mitogenic and chemotactic glycoprotein by monocytes and macrophages. Heparin-binding EGF-like growth factor* (HB-EGF, pm 22 kDa) is a 87 amino acid glycoprotein, member of the epidermal growth factor (EGF), termed HB-EGF for his affinity with heparin. It's synthesized as a membrane-anchored mitogenic and chemotactic glycoprotein by monocytes and macrophages. •	membrane-anchored protein (proHB-EGF), which is known to be a juxtacrine growth factor, composed of a signal peptide, propeptide, heparin-binding, EGF-like, juxtamembrane, transmembrane, and cytoplasmic domains. •	ProHB-EGF is cleaved at its iuxtamembrane domain by metalloproteases in a process called ectodomain shedding . 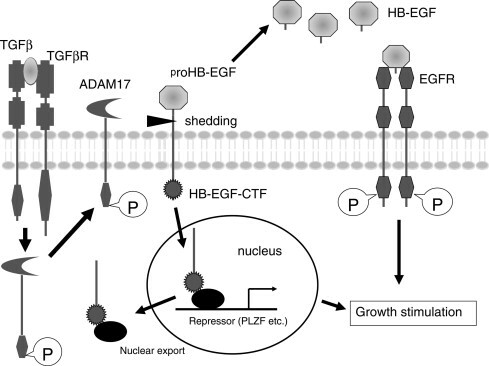 Ectodomain shedding of proHB-EGF yields a soluble form of HB-EGF. Shedding is accelerated when proHB-EGF-expressing cells are exposed to certain stress conditions. •	Upon cleavage, the HB-EGF C-terminal fragment translocates into the nucleus and induces gene expression of cyclinA and cyclinD2 by suppressing the function of PLZF and Bcl6, respectively. •	Soluble form of HB-EGF (sHB-EGF) is a potent mitogen and chemo-attractant for cells expressing its cognate ErbB receptors. Heparin-binding EGF-like growth factor has been shown to interact with NRD1, Zinc finger and BTB domain-containing protein 16 and BAG1. The NRD1 gene codes for the protein nardilysin, metallopeptidase of the M16 family, presents, in vitro, cleavage specificity for basic residues. Depending on the cell type, it is cytoplasmic, exported or cell surface associated. As a new receptor for heparin-binding EGF-like growth factor (HB-EGF), NRDc was recently shown to be involved in cellular migration and proliferation as HB-EGF modulator. Zinc finger and BTB domain containing protein 16 and BAG family molecular chaperone regulator function as co-chaperone proteins in processes involving HB-EGF. HB-EGF binding and activation of EGF receptors plays a critical role during cardiac valve tissue development and the maintenance of normal heart function in adults. During valve tissue development the interaction of HB-EGF with EGF receptors and heparan sulfate proteogylcans is essential for the prevention of malformation of valves due to enlargement. In the vascular system areas of disturbed flow show upregulation of HB-EGF with promotion of vascular lesions, atherogenesis, and hyperplasia of intimal tissue in vessels. The flow disturbance remodeling of the vascular tissues due to HB-EGF expression contributes to aortic valve disease, peripheral vascular disease, and conduit stenosis. HB-EGF is the predominant growth factor in the epithelialization required for cutaneous wound healing. The mitogenic and migratory effects of HB-EGF on keratinocytes and fibroblasts promotes dermal repair and angiogenesis necessary for wound healing and is a major component of wound fluids. HB-EGF displays target cell specificity during the early stages of wound healing being released by macrophages, monocytes, and keratinoctyes. HB-EGF cell surface binding to heparan sulfate proteoglycans enhances mitogen promoting capabilities increasing the rate of skin wound healing, decreasing human skin graft healing times, and promotes rapid healing of ulcers, burns, and epidermal split thickness wounds. HB-EGF is recognized as an important component for the modulation of cell activity in various biological interactions. •	Found widely distributed in cerebral neurons and neuroglia, HB-EGF induced by brain hypoxia and or ischemia subsequently stimulates neurogenesis. •	Interactions between uterine HB-EGF and epidermal growth factor receptors of blastocysts influence embryo-uterine interactions and implantation. •	Studies show HB-EGF protects intestinal stem cells and intestinal epithelial cells in necrotizing enterocolitis, a disease affecting premature newborns. Associated with a breakdown in gut barrier function, necrotizing enterocolitis may be mediated by HB-EGF effects on intestinal mucosa. •	HB-EGF expressed during skeletal muscle contraction facilitates peripheral glucose removal, glucose tolerance and uptake. The upregulation of HB-EGF with exercise may explain the moleuclar basis for the decrease in metabolic disorders such as obesity and type 2 diabetes with regular exercise. Recent studies indicate significant HB-EGF gene expression elevation in a number of human cancers as well as cancer-derived cell lines. Evidence indicates that HB-EGF plays a significant role in the development of malignant phenotypes contributing to the metastatic and invasive behaviors of tumors. For numerous cell types such as breast and ovarian tumor cells, human epithelial cells and keratinocytes HB-EGF is a potent mitogen resulting in evidenced upregulation of HB-EGF in such specimens. Both in vivo and in vitro studies of tumor formation in cancer dervived cell lines indicate that expression of HB-EGF is essential for tumor development. LPA is elevated in the plasma and peritoneal fluid from patients with ovarian cancer in all stages, suggesting that it is a possible candidate for an ovarian cancer–activating factor. 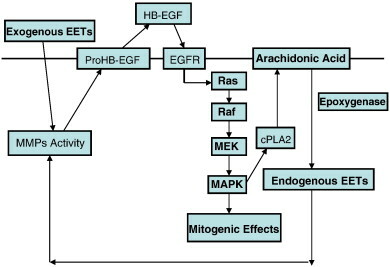 In principle, LPA-induced signaling is mediated by G protein-coupled receptors, including LPA1-4, that are able to use the epidermal growth factor receptor (*EGFR*) as a downstream signaling partner in the generation of mitogenic signals, and EGFR has been recognized to play a pivotal role in the progression of ovarian cancer. In particular we know that HB-EGF is involved in this EGFR signal transactivation and that the expression of HB-EGF is attributable to tumor growth on xenografted mice using ovarian cancer cell lines. The molecular mechanisms of EGFR signal transactivation involve processing of transmembrane growth factor precursors by metalloproteases, which have been identified as members of the ADAM (a disintegrin and metalloprotease) family of zinc-dependent proteases. For the metalloproteases, there have been at least 34 ADAM genes described in a variety of species, in particular, ADAM 9, 10, 12, and 17 are involved in the ectodomain shedding of EGFR ligands. The enhancement of EGFR signal transactivation mediated by EGFR ligands and the ADAM family is linked to the pathogenesis of hyperproliferative disorders, such as cancer. To investigate which molecules involved in EGFR signal transactivation are associated with human ovarian cancer, they examined the expression of EGFR ligands and ADAM family members in patients with ovarian cancer, using real-time PCR, and analyzed the clinical significance of these molecules in ovarian cancer. HB-EGF have eleveted affinity for EGFR, who is involved in several biochimicals changes in cells by activation of MAPK’s signaling. It increase calcium level, glicolisis activation and synthesis of proteins. It’s now know that CXCL1 functions through CXCR2 to transactivate the EGFR by proteolytic cleavage of HB-EGF, leading to activation of MAPK signalling and increased proliferation of EOC cells. The chemokine CXCL1 is elevated in plasma and ascites from patients with ovarian cancer and is a marker of phosphatidylinositol 3-kinase signalling in epithelial ovarian cancer (EOC) cell lines, a pathway that is commonly activated in ovarian tumours. To investigate whether CXCL1 also has functional significance in ovarian cancer, this chemokine was either down-regulated using siRNAs or overexpressed by transfection of CXCL1 into the EOC cell lines SKOV3 and OVCAR-3 and proliferation assessed over 7 days. Overexpression of CXCL1 increased proliferation of ovarian cancer cells over 7 days, while down-regulation was inhibitory. Treatment of cells with recombinant CXCL1 induced epidermal growth factor receptor (EGFR) phosphorylation at Y1068, indicating crosstalk between the CXCL1 G-protein-coupled receptor CXCR2 and the EGFR. CXCL1 induced proliferation was also decreased by inhibition of EGFR kinase activity and was dependent on extracellular matrix metalloproteinase-mediated release of heparin-binding EGF (*HB-EGF*). Involvement of mitogen activated protein kinase (MAPK)/extracellular signal-regulated kinase 1/2 (ERK1/2) signalling was also evident since inhibition of both Ras and MEK activity decreased CXCL1-induced proliferation. CXCL1-induced ERK1/2 phosphorylation was inhibited by the MEK1 inhibitor PD98059; however, EGFR phosphorylation was unaffected, indicating that CXCL1 activation of MAPK signalling is downstream of the EGFR. Taken together, these data show that CXCL1 functions through CXCR2 to transactivate the EGFR by proteolytic cleavage of HB-EGF, leading to activation of MAPK signalling and increased proliferation of EOC cells. Tumor formation by human ovarian cancer cell lines was enhanced by exogenous expression of proHB-EGF and completely blocked by proHB-EGF gene RNA interference or by CRM197, a specific HB-EGF inhibitor. It has also been shown that HB-EGF expression is significantly associated with the clinical outcome in ovarian cancer. Based on these evidences, HB-EGF is now considered to be an attractive therapeutic target in human. In this study, we developed a novel method with high sensitivity and specificity for the determination of soluble HB-EGF concentrations in human serum. In order to develop a sandwich ligand binding assay method, we chose a combination of the two antibodies; a mouse monoclonal anti-HBEGF antibody as a capture antibody and a goat polyclonal anti-HB-EGF antibody as a detection antibody. First, we developed a sandwich ELISA with horseradish peroxidase detection system using the two antibodies described above. However, no endogenous HB-EGF was detected in sera of ovarian cancer patients and healthy volunteers due to the low sensitivity. We then sensitized the method by introducing immuno-PCR, resulting in the change of lower limit of quantification (LLOQ) from 100 to 5 pg/mL. Immuno-PCR is a method which combines the specificity of antibodies with the sensitivity of PCR. There are some previous reports on the method development of immuno-PCR. Using our method, we quantified soluble HBEGF levels in healthy volunteers and ovarian cancer patients. As a result, we demonstrated that ovarian cancer patients showed significantly higher level of HB-EGF than healthy volunteers. This is the report suggesting that soluble HBEGF detected by newly developed immuno-PCR system can be a clear-cut serological biomarkers for ovarian cancer. Growth factors of the EGF family are generally not considered to be promising targets for cancer therapy because there are many growth factors that can provide growthpromoting signals redundantly, and when a sole factor is neutralized, other ligands are suspected to compensate for it. However, increasing evidence has suggested that HB-EGF is expressed predominantly among all of the growth factors of the EGF family in ovarian cancer and has a pivotal role in its progression. In addition, Yagi and colleagues recently reported that a chemotherapeutic agent, paclitaxel, induced transient ERK and Akt activation through elevated expression and ectodomain shedding of HB-EGF, resulting in the escape from apoptosis. CRM197, a nontoxic mutant of diphtheria toxin and a specific inhibitor of HB-EGF, showed synergistic antitumor activities with paclitaxel by restoring the sensitivity to paclitaxel in ovarian cancer SKOV-3 cells. These studies suggest that an anti-HBEGF agent is expected to be effective and exert synergistic antitumor activities with chemotherapeutic agents such as paclitaxel against ovarian cancer.